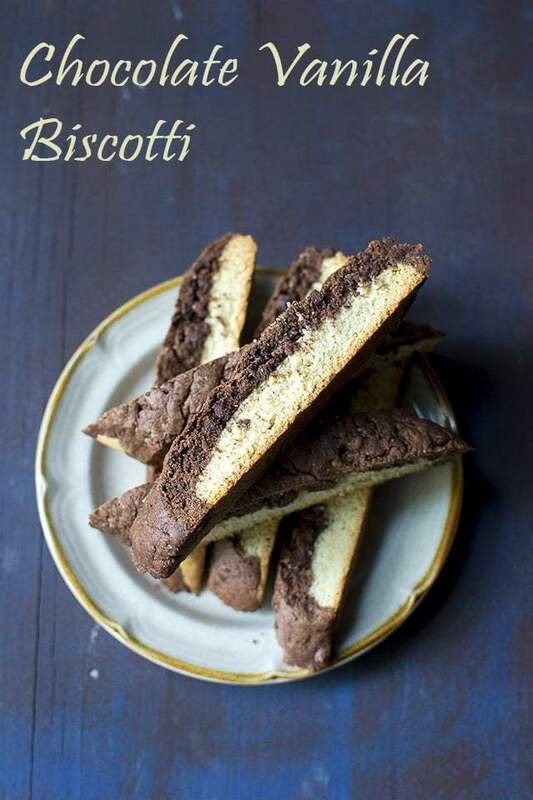 ￼Recipe to make Chocolate Vanilla Biscotti -- perfect to dunk in some coffee. If you are thinking chocolate or vanilla -- make them both. Preheat oven to 350°F. Lightly grease or line a large baking sheet with parchment paper. In a mixing bowl, beat butter, sugar, salt, vanilla and baking powder until the mixture is smooth and creamy. Beat in the eggs or egg replacer mixture; the batter may look slightly curdled. Finally stir in the flour and mix until smooth; the dough will be sticky. Divide the dough in half, leaving half in the bowl and half on the prepared baking sheet. Shape the dough on the baking sheet into a log about 14" long and 2½" wide. Wet your fingers to help you in shaping the log. Place the baking sheet in the freezer while you prepare the chocolate part of the biscotti. In the remaining half of the dough, add cocoa powder, chocolate chips and espresso powder. Stir to combine all the ingredients. Remove the baking sheet from the freezer and spread the chocolate mixture right on top of the vanilla dough. Pressing it down the sides to entirely enclose the vanilla portion. Alternately you can leave the chocolate portion only on the top like a double decker. Bake the dough for 25 minutes. Remove from the oven and cool on the pan about 10~25 minutes. Using a sharp serrated knife, cut the biscotti at a diagonal into ¾" slices. Set them on edge, back on the baking sheet and return the biscotti to the oven and bake for 30~40 minutes or until they feel very dry and are beginning to turn golden. Remove the biscotti from the oven and transfer them to a wire rack to cool.